The D.C. Board of Elections says that the city’s voting machines are outdated and in need of replacement, an admission that comes only weeks before what could be a close mayoral election. I always use a paper ballot. I like to leave a paper trail when I vote. But for some reason it’s hard for me to convince others to use the paper ballot. It’s like I’m asking to dump your electric lights for candles. How did the touch screen voting machine, a device that doesn’t produce material evidence to the voter, earn the trust of so many? Is it fear of being labeled “old school” or 20th century? Or does the machine guarantee you’ll know election results before your bedtime? Lest we forget the DC primaries in April. It was the electronic voting machines that fueled the delay in getting the results of the primary elections. This is an unusual year in DC politics. it may be the first time the Democratic nominee for Mayor is not the de-facto winner. This may also be a year where identity politics won’t hold sway as no Mayoral candidate can be assured of votes from persons who resemble their personal demographics — by race, gender, age, or party. When it comes to effectiveness and results, Councilmember-At-Large David Cantania’s record stands out; whereas Councilmember Muriel Bowser appears stronger on personality — at least that’s the framing from the politicos. How can a victory happen for DC Democrats November 4 on their machine’s watch? As the race and the poll numbers tighten from double to single digits between Muriel Bowser (D) and former Republican David Catania (I), Democrats will need to give “D-Day” its military meaning. This will be a ground offense to get out the vote. And in light of corruption charges, verdicts, and investigations of members in the local party, the Ds have to show proof of a clean election. They also have the weight of the Democratic party to shoulder for if DC goes, so goes the Democratic party’s confidence in its ability to hold onto its own. And Independents come in all political shades. Tight polling numbers, voter apathy, and questionable voting machines are the ingredients for a questionable election. Will the outdated touch screen voting machines be replaced by November 4? My father used to say “they’ll rob you with a pencil.” At least with the pencil, you know how you was robbed. Maybe it’s time to call in Jimmy Carter? Early voting in the District of Columbia opens October 20 – November 1. More information is at https://www.dcboee.org. Let’s hope DC’s BOE has enough paper ballots. Filmmaker Phillip Rodriguez explores all the M’s in his documentary RUBEN SALAZAR: MAN IN THE MIDDLE. This is the first time I’ve heard the Ruben Salazar story — yes, I’m in the slow lane on Chicano history. Hispanic Heritage Month gives me a chance to excelerate. Where was the middle for Ruben Salazar? Middle of the battle for Chicano civil rights? Middle of the L.A. Times newsroom in the 1960s? How many of us have had those border crossing or cross-over lives (figuratively and literally speaking) only to have those borders cross over us? What really killed Ruben Salazar? Does his story resonate with a new generation? 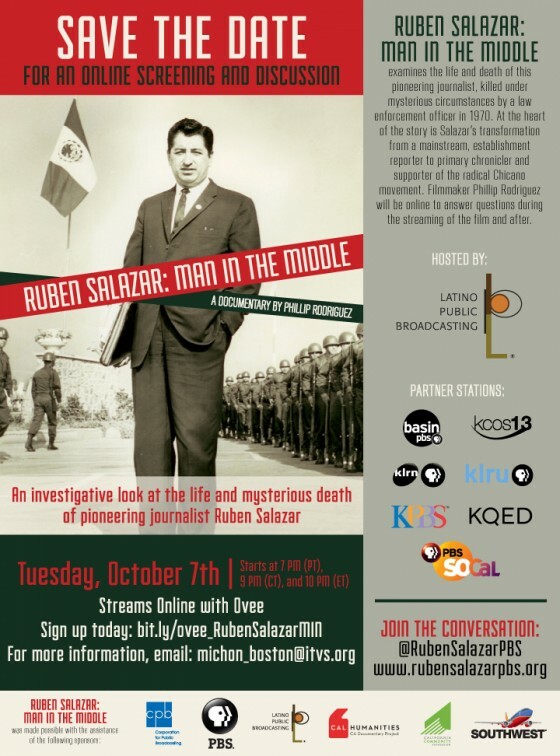 Watch RUBEN SALAZAR: MAN IN THE MIDDLE and join me in a chat with Phillip Rodriguez and Julio Ricardo Varela (founder of Latino Rebels) on OVEE (Online Video Engagement Experience) Tuesday, October 7 at 7 PM (PT), 9 PM (CT), 10 PM (ET). Go to this link: bit.ly/ovee_RubenSalazarMIN.